Probably doesn’t matter, but that’s cool. Good for Ben Stiller, or whatever. Early yesterday morning, Ben Stiller held a special press conference specifically to announce that anyone who possesses a DodgeBall DVD, Blu-ray, or poster that features the tagline “Grab Life By The Ball” should know that those are inferior, outdated versions of the film that no longer have his stamp of approval. The actor paused after saying that he’d obtained co-star Vince Vaughn’s blessing to do so, clearly under the impression that this was something people would get excited over and not something that would be downright bizarre for Vince Vaughn or literally anyone at all to care about. Stiller concluded the press conference by removing a black cloth hanging over an easel on stage that displayed a side-by-side comparison of one DodgeBall poster with the old tagline, and one with the new tagline, the difference between the two entirely unimportant to everyone present except Ben Stiller. 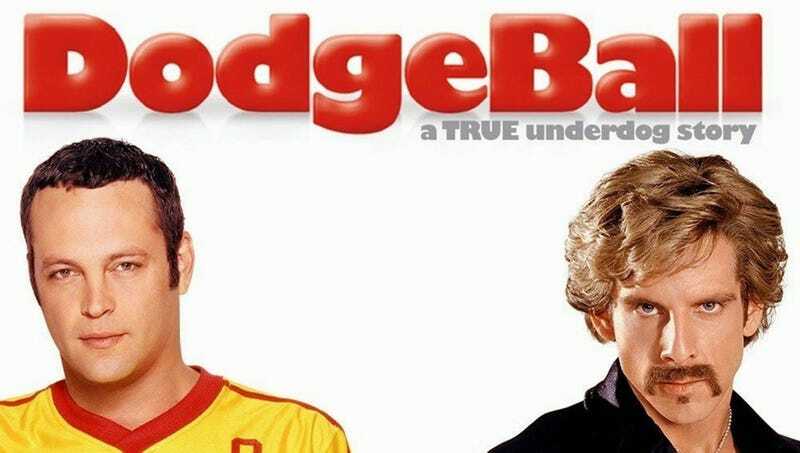 After careful consideration, I am excited to announce that “How A Couple Of Average Joes Saved The Day” will be the new tagline for DodgeBall. This was the DodgeBall DVD cover that the world was meant to see. While the original tagline, “Grab Life By The Ball,” was an appropriate tagline for the film, as keen-eyed viewers will notice that it is a dodgeball-related twist on the inspirational phrase “grab life by the horns,” as well as a sexual innuendo that comedy audiences would be sure to appreciate, it is my firm belief as the film’s producer and co-star that “How A Couple Of Average Joes Saved The Day” is an even more fitting tagline, since it is a play on the protagonists’ team name, the Average Joes, as well as the film’s story about a group of underdogs who succeed against great odds. Our fans deserve nothing less than the best version of this film we could give them, so if you own a DodgeBall poster with the out-of-date tagline, I urge you to cross it out with a marker and write the new, correct tagline instead. Wow. Now, the next time you see a re-run of DodgeBall on USA or whatever, you can appreciate that it’s been very slightly updated. Ben Stiller has gone far out of his way for something pretty inconsequential, and that’s something we can all briefly acknowledge and then quickly shrug off.